Paul and Lesley McKnight with Callum, Amy and Lydia are missionaries in the Highlands of Papua New Guinea. Paul continues to work in the school and Lesley in the clinic, supporting those who are planting churches in remote tribal settings. Paul has been kept busy teaching two geography classes, a Bible class and his usual selection of physical education classes at Numonohi Christian Academy. He has also been coaching extra-curricular sports teams and organising sports tournaments for government and private schools within the Eastern Highlands Province. 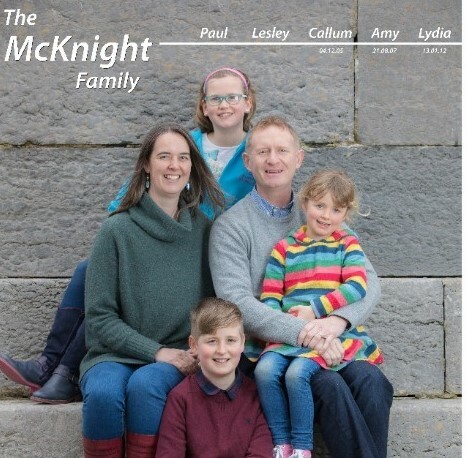 In the sixteen years Paul and Lesley have served with NTM, God has been faithful to provide all they have needed through many faithful supporters. He has faithfully answered so many prayers with awesome deeds. They have seen Him bring many new missionaries, several who are preparing to work amongst remote tribes. There is a full quota of staff for the school this year and a third doctor for the clinic. He has brought restoration to struggling churches, and enabled missionaries who are learning difficult languages, or translating Scripture into those languages. He has given those missionaries wisdom as they have discipled young believers. The Lord spared the life of a missionary recently. He fell off the roof of a house he was helping to build in Oct 2018. Pray for continued healing as Jacob recovers from a fractured femur. He is back walking again. God truly is the hope of everyone on earth, and that is why Paul and Lesley remain in PNG, to help proclaim that hope for as long as He would have them there. Lesley continues to use her physiotherapy training. The clinic work is very varied, and she is enjoying being part of the broader medical team as they serve the missionary and local PNG community. They have had the chance to hold several immunisation clinics to help vaccinate against diseases like measles and polio. Paul led an expedition for about twenty school students and some parents to Mt. Wilhelm PNG’s highest mountain (4509m) in November. They had fantastic weather and everyone made it safely to the top and back, including Callum who was the youngest person on the trip! The kids are all enjoying school, as well as extra-curricular sports and activities. Pray for Lydia as she is starting to receive some extra help for math and reading. They feel very blessed that they were able to visit Lesley’s parents in Australia over Christmas. Paul and Lesley have been asked to help with the Interface programme again, this summer in Madang at one of the smaller support centres by the coast. It is a six-week college/university level course giving the opportunity for those involved to see first-hand what it takes to plant a church among people who have no concept of the God of the Bible. Pray for those who are considering attending this summer, that God would bring together a group that will be deeply impacted by Him, as they seek what part of missions God would have them be involved in. Pray for Paul and Lesley as they teach and interact with them as a family. Praise the Lord that three more people groups in PNG will soon have the Gospel presented to them! Pray for safety in travel on the roads as they are in the worst condition Paul and Lesley have seen in PNG since they arrived in 2003. Thank you for all your prayers, we need them!